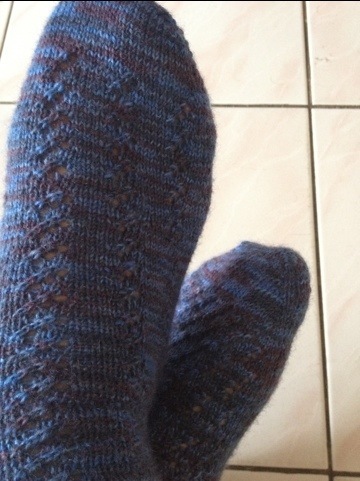 So, toe up socks are awesome. These waterfall socks were recommended to me by knitting on circular needles when I was having a twitter conversation regarding socks. Now I don’t think I’ll go back. I learnt the turkish cast on for a trio of baby socks for my nephew (I’ll have to show you those, they are adorable), and then went chasing patterns for grown-up toe up socks. And I love these socks. 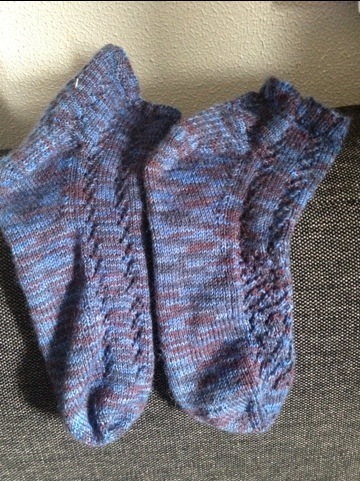 Albeit they don’t quite match as it took me a while to read the pattern properly. 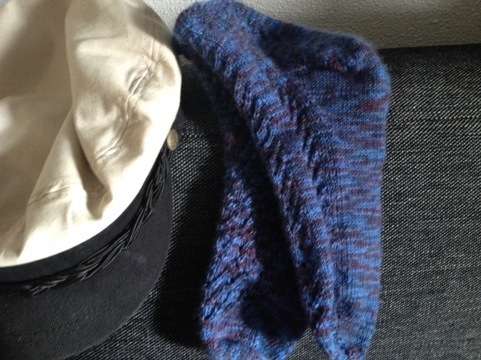 But it won’t take me long to knit up another one. Maybe in a different colour, just for something different (I love odd socks). And the beauty of toe-up socks is they eliminate one of (what I find) the most annoying parts of a cuff-down sock and that’s picking up all the stiches after you finish turning the heel. All the information I’ve read about cuff-down socks is that turning the heel is the tricky part, and the rest is straightforward. Well it’s a lie I tell you… Picking up those pesky stiches is very annoying, and it’s always looks like the most unfinished section of my socks. So toe-up socks is the answer. 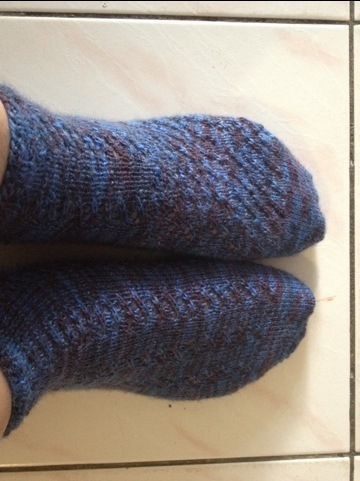 The yarn is Moda Vera Noir, in blue. And they’re going to remind me of Christmas, Wuthering Hights, and holidays.